Mentos, part of the Perfetti Van Melle group, was launched in the Netherlands 1932 and has grown to become a major player around the globe, now available to purchase in over 100 countries. 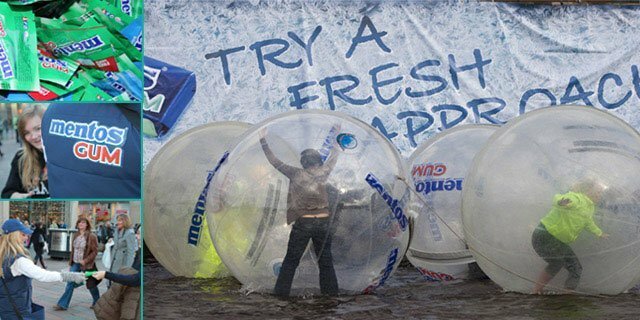 Kommando helped Mentos establish their range of gum using an integrated guerrilla marketing, PR, social media and sampling campaign which saw commuters “taking a fresh approach” to their morning routine and aqua zorbing to work. Results At A Glance: Over a 2 week sampling campaign 400,000 samples and 50,000 full packs were distributed. Thousands of consumer data was captured and there was increased awareness of the new product as a result of the massive PR generated through the stunt and sampling campaign.